Captain James Cook had the fortune of leading three historically epic adventures in his lifetime. The best way to experience a journey like these would be through the eye of the beholder, and in this case, a captain’s log is the next best thing. Check out the following excerpt from The Voyages of Captain James Cook chronicling the earliest stages of the first voyage Captain Cook embarked on, in the summer if 1768, upon his beloved ship, the Endeavour. This extract from Cook’s manuscript journal is matter-of-fact, but exemplifies the navigator’s precise and practical approach to the business of fitting out the Endeavour and the early stages of the voyage. RIVER THAMES, FRIDAY, MAY 27TH, TO FRIDAY, JULY 29TH . Moderate and fair weather; at 11 a.m. hoisted the Pendant, and took charge of the Ship, agreeable to my Commission of the 25th instant, she lying in the Bason in Deptford Yard. From this day to the 21st of July we were constantly employed in fitting the Ship, taking on board Stores and Provisions, etc. The same day we sailed from Deptford and anchored in Gallions reach, were we remained until the 30th. The transactions of Each Day, both while we lay here and at Deptford, are inserted in the Log Book, and as they contain nothing but common Occurrences, it was thought not necessary to insert them here. JULY 30TH TO AUGUST 7TH. Saturday, July 30th, Weighed from Gallions, and made sail down the River, the same day Anchored at Gravesend, and the next Morning weighed from thence, and at Noon Anchored at the Buoy of the Fairway. On Wednesday, 3rd of August, Anchored in the Downs in 9 fathoms of water, Deal Castle North-West by West. On Sunday, 7th, I joined the Ship, discharged the Pilot, and the next day saild for Plymouth. MONDAY, 8TH. Fresh Breezes and Cloudy weather the most part of these 24 hours. TUESDAY, 9TH. Gentle breezes and Cloudy weather. At 7 p.m. the Tide being against us, Anchored in 13 fathoms of Water; Dungeness South-West by West. At 11 a.m. Weighed and made Sail down Channel; at Noon, Beachy Head, North by East ½ East, distant 6 Leagues, Latitude observed 50 degrees 30 minutes North. Wind NorthWes to North. WEDNESDAY, 10TH. Variable: light Airs and Clear weather. At 8 p.m. Beachy Head NorthEast by East, distant 4 Leagues, and at 8 a.m. it bore North-East by North, 9 Leagues. North-West by North. Wind West by North, North-East by East. THURSDAY, 11TH. Light Airs and Clear weather. At 8 p.m. Dunnose North by West 5 Leagues, and at 4 a.m. it bore North-North-East ½ East, distant 5 Leagues. Wind Variable. WEDNESDAY, 12TH. Light Airs and Calms all these 24 Hours. At Noon the Bill of Portland bore North-West ½ West, distant 3 Leagues. Latitude Observed 50 degrees 24 minutes North. Wind Easterly. SUNDAY, 14TH. Fine breezes and Clear weather. At ½ past 8 p.m. Anchored in the Entrance of Plymouth Sound in 9 fathoms water. At 4 a.m. weighed and worked into proper Anchoring ground, and Anchored in 6 fathoms, the Mewstone South-East, Mount Batten North-North-East ½ East, and Drake’s Island North by West. Dispatched an Express to London for Mr. Banks and Dr. Solander to join the Ship, their Servants and Baggage being already on board. Wind North-Easterly. MONDAY, 15TH. First and latter parts Moderate breezes and fair; Middle squally, with heavy showers of rain. I this day received an order to Augment the Ship’s Company to 85 Men, which before was but 70. Received on board fresh Beef for the Ship’s Company. Wind South-West to South-East. TUESDAY, 16TH. First part moderate and Hazey; Middle hard Squalls with rain; the Latter moderate and fair. Received on board a supply of Bread, Beer, and Water. A Sergeant, Corporal, Drummer, and 9 Private Marines as part of the Complement. Wind SouthSouth-East to North-East. WEDNESDAY, 17TH. Little wind and Hazey weather. Sent some Cordage to the Yard in order to be Exchanged for Smaller. Several Shipwrights and Joiners from the Yard Employed on board refitting the Gentlemen’s Cabins, and making a Platform over the Tiller, etc. Wind South-East to East by South. THURSDAY, 18TH. Little wind and Cloudy. Struck down 4 guns into the Hold. Received on board 4 More, with 12 Barrels of Powder and several other Stores. Shipwrights and Joiners Employed on board. Wind Easterly. FRIDAY, 19TH. Former part little wind with rain; remainder fair weather; a.m. Read to the Ship’s Company the Articles of War and the Act of Parliament, they likewise were paid two Months’ Wages in advance. I also told them that they were to Expect no additional pay for the performance of our intended Voyage; they were well satisfied, and Expressed great Cheerfulness and readiness to prosecute the Voyage. Received on board another Supply of Provisions, Rum, etc. Wind North-West to South-West. MOORED IN FUNCHAL ROAD, MADEIRA, WEDNESDAY, [SEPTEMBER] 14TH. First part fine, Clear weather, remainder Cloudy, with Squals from the land, attended with Showers of rain. Anchor in the Boat and carried it out to the Southward. In heaving the Anchor out of the Boat Mr. Weir, Master’s Mate, was carried overboard by the Buoy rope and to the Bottom with the Anchor. Hove up the Anchor by the Ship as soon as possible, and found his Body intangled in the Buoy rope. Moor’d the Ship with the two Bowers in 22 fathoms Water; the Loo Rock West and the Brazen Head East. Saild His Majesty’s Ship Rose. The Boats employed carrying the Casks a Shore for Wine, and the Caulkers caulking the Ship Sides. Wind Easterly. THURSDAY, 15TH. Squals of Wind from the Land, with rain the most part of these 24 Hours. Received on board fresh Beef and Greens for the Ship’s Company, and sent on shore all our Casks for Wine and Water, having a Shore Boat employed for that purpose. Wind North-East to South-East. Thomas Dunster, Marine, with 12 lashes each, for refusing to take their allowance of Fresh Beef. Employed taking on board Wine and Water. Wind Easterly. SATURDAY, 17TH. Little wind, and fine Clear weather. Issued to the whole Ship’s Company 20 pounds of Onions per Man. Employed as Yesterday. Wind Westerly. SUNDAY, 18TH. Ditto Weather. P.M. received on board 270 pounds of fresh Beef, and a Live Bullock charged 613 pounds. Compleated our Wine and Water, having received of the former 3032 Gallons, of the Latter 10 Tuns. A.M. unmoor’d and prepar’d for Sailing. Funchall, in the Island of Madeira, by Observations made here by Dr. Eberton, F.R.S., lies in the latitude of 32 degrees 33 minutes 33 seconds North and longitude West from Greenwich 16 degrees 49 minutes, the Variation of the Compass 15 degrees 30 minutes West, decreasing as he says, which I much doubt; neither does this Variation agree with our own Observations. The Tides flow full, and Change North and South, and rise Perpendicular 7 feet at Spring Tides and 4 feet at Nieptides. We found the North point of the Diping Needle, belonging to the Royal Society, to Dip 77 degrees 18 minutes. The Refreshments for Shipping to be got at this place are Wine, Water, Fruit of Several Sorts, and Onions in Plenty, and some Sweatmeats; but Fresh Meat and Poultry are very Dear, and not to be had at any rate without Leave from the Governour. Wind southerly, East-South-East,South-West. The first-ever illustrated account of Captain James Cook’s epic eighteenth-century voyages, complete with excerpts from his vivid journals. This is history’s greatest adventure story. In 1766, the Royal Society chose prodigal mapmaker and navigator James Cook to lead a South Pacific voyage. His orders were to chart the path of Venus across the sun. That task completed, his ship, the HMS Endeavour, continued to comb the southern hemisphere for the imagined continent Terra Australis. The voyage lasted from 1768 to 1771, and upon Cook’s return to London, his journaled accounts of the expedition made him a celebrity. After that came two more voyages for Cook and his crew, followed by Cook’s untimely murder by natives in Hawaii. 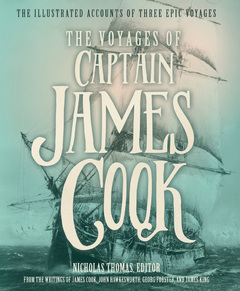 The Voyages of Captain James Cook reveals Cook’s fascinating story through excerpts from his journals, as well as illustrations, photography, and supplementary writings. During Cook’s career, he logged more than 200,000 miles – nearly the distance to the moon. And along the way, scientists and artists traveling with him documented exotic flora and fauna, untouched landscapes, indigenous peoples, and much more. In addition to the South Pacific, Cook’s voyages took him to South America, Antarctica, New Zealand, the Pacific Coast from California to Alaska, the Arctic Circle, Siberia, the East Indies, and the Indian Ocean. When he set out in 1768, more than one-third of the globe was unmapped. By the time Cook died in 1779, he had created charts so accurate that some were used into the 1990s. The Voyages of Captain James Cook is a handsome illustrated edition of Cook’s selected writings spanning his Pacific voyages, ending in 1779 with the delivery of his salted scalp and hands to his surviving crewmembers. It’s bound to enthrall anyone who appreciates history, science, art, and classic adventure.